Return to Fractions word problem: Calculate the remaining pipe length. Join in and write your own page! It's easy to do. How? 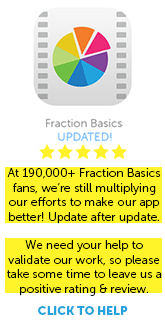 Simply click here to return to Fractions Library. Wait! Sign up now and we will give you full math game app and content worth $99 for FREE when we launch! Fill in your email below and stay tune!